​Almanac: The eye chart – CBS News. Well here we go again..it’s time for fall! 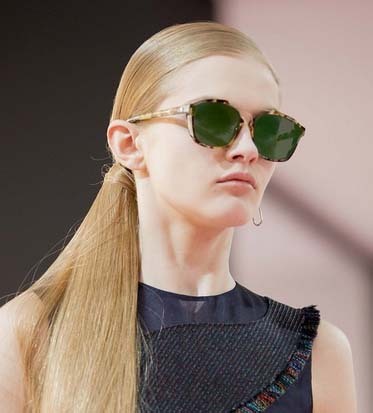 Sunglasses this year are pretty much a continuation of the last few years….lots of updated looks some “geek glasses” from Gucci. looks as well as big bold coloring as in Karen Walker. And though most of you might think of sunglasses are only for the summer, think again! Our eyes need the UV protection we typically get from sunglasses all year round and is we were prescription eyeglasses then we must take care to have photochromic or polarized sunglasses protection. Lots of whimsical 60’s and 70’s feel comes in..cutouts, fringe, even gloves make a comeback on the runways for fashion and so the sunglasses and eyeglasses we see all reflect this time. Some fun styles from Christian Dior and Louis Vuitton show us how easily we can update our eyeglasses with a little fun tint to keep the cold months fun and bright. 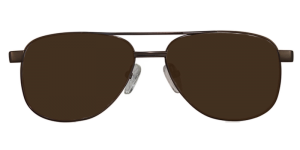 The brow bars sunglasses are a great updated look from the browline glasses or even the plain wayfarers many a celebrity is seen sporting these on the streets. 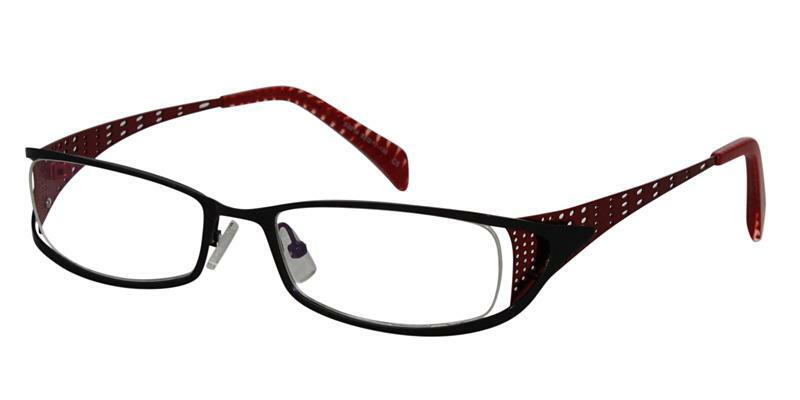 Along with fun bejeweled cateyes there are ones that are softer, and vintage inspired marbled cateye sunglasses. 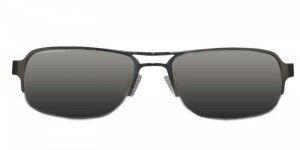 Then we have the mirrored sunglasses which are seen in all shapes. 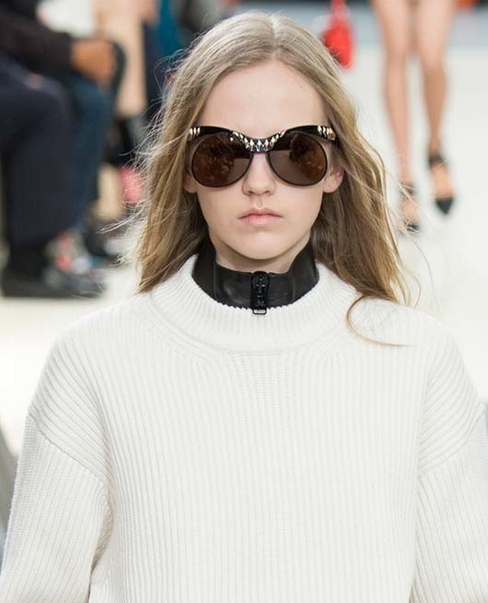 Especially the round and aviators are seen on the streets as well as on the runways. While these are some of the styles seen on the runway…I always like to see what people are wearing on the streets in all the main cities around the world..
Cat eye glasses with all the trimmings! Have fun with your eyeglasses especially if you wear prescription eyeglasses as you can change you style very often and sport different looks. The two brand new Bvulgari luxury bejeweled eyewear lines released by the fashion house are beyond the greatest expectations of ours. We are so excited to discover the latest Karen Walker eyewear collection for fall 2015 that’s all about fresh designs and colorful frames. 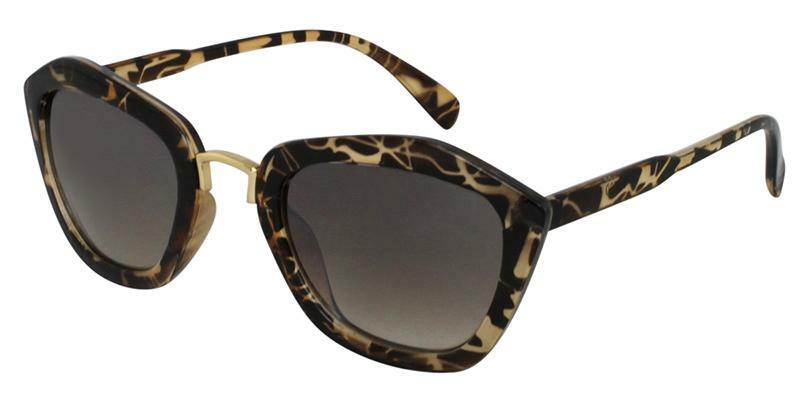 Karen Walker has created a wonderful line that is gaining popularity around the world after her inital debut. Originally designed to protect pilots’ eyes against the elements, Ray-Ban’s classic sunglasses have crossed over from cockpit to catwalk. Katya Foreman looks back. Well it’s that time of the year again, are you ready for the beauty, joy and happiness that 2015 is going to bring you? Well you had better be, as it’s here in four days and we want to be sure you are on the mark with the coming trends for women. 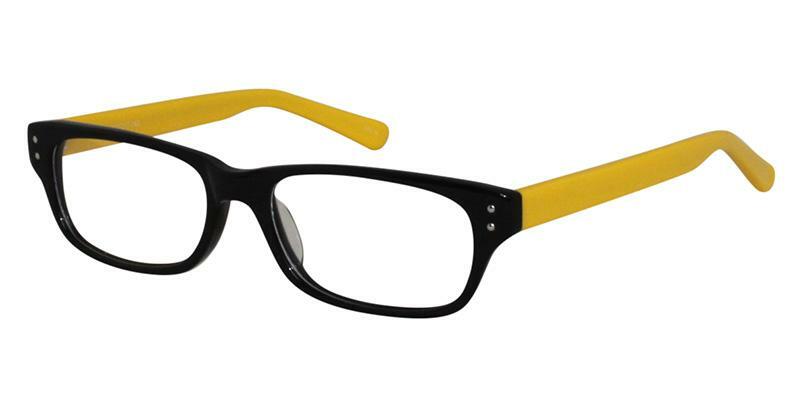 The trendy glasses that we have seen in the past have basically been retro and this coming year is not much different. was one of the fun years for you so you can renew your hipness! The ’70’s continue to drive the looks for the coming year with just the slightest updates to the looks to match our current modern tastes. 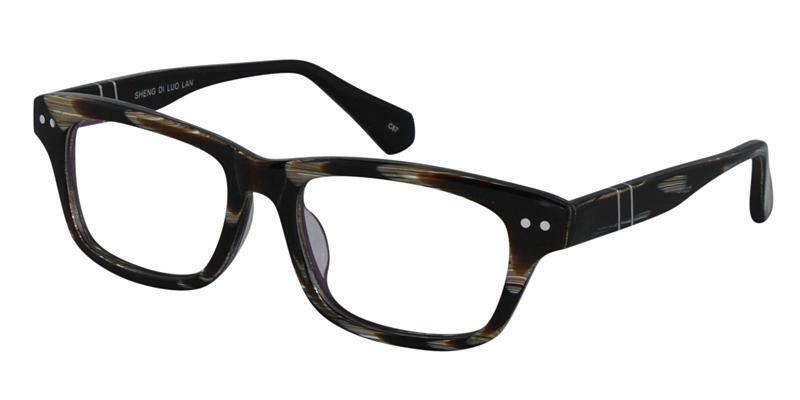 We see on the runways for Spring 2015 glasses with soft coloring, as well as animal prints with a lighter back ground color then what we would see in the fall. Tortoise coloring is great with the lighter shades. Soft neutrals like the beige (eggshells), browns basically earth tones… and of course lets not for get the hottest colors for the coming year are shades of green (Aquamarine to olives) to shades of blue (Pantone says more blue others say more green) Bright prints ala Pucci keeping things hot, big prints colorful brushstrokes, abstracts, large flowers..all in the spirit of fun, openness and a carefree lifestyle. Anything romantic goes as with the makeup…laces, crochet all very bohemian in simple shapes that are nicely tailored. Understated elegance…hippie-chic….”ethnic” fashions are all in the realm of the 70’s retro look. Just let loose..baby! Add to this some trendy glasses, which are a great way to add focus to your look and enhance your eyes by picking eyeglasses shapes that are flattering to you face shape and compliment your look by balancing your features. Eyeglasses are now the “new nighttime accessory” according to style.com; so update you evening looks with crisp fashion glasses in all the right shapes and colors (and of course they don’t have to be prescription eyeglasses they can be clear). Spring 2015 Trend Report – Gallery – Style.com. Unlike us here in Los Angeles where we are still enjoying (sorry) 70+ degree weather, no doubt most around the country need to start layering up. Well I wanted to be sure you are in the know here. Take a look and see the cool ideas for layering because as they say.. The challenge is always to look well put together, rather than a big ball of fabric waddling around. Keeping you attention to how your body feels under the clothes is important. If you feel stifeled chances are you will look like you are drowning; if you feel bound and can’t move freely, chances are this too will come through in your movement and you look. So take a minute and see what works for you. Layered Look for Winter 2014 – Vogue.